Colonel Mitchell is injured in a skirmish with a warrior from a mythic tribe of rebel Jaffa, and is trained in their fighting techniques only so that he may engage in a ritual battle to the death. SG-1 and SG-22 investigate a planet Teal’c learns may be a home of the ancient Sodan, a race of Jaffa who have managed to avoid falling under the allegiance of a Goa’uld for five millennia. But SG-1 becomes a target for staff weapon fire. While Colonel Samantha Carter, Dr. Daniel Jackson and Teal’c escape, Colonel Cameron Mitchell confronts an uncloaking Sodan. After suffering a staff hit to the stomach area, Mitchell gains control of the weapon and shoots the Jaffa twice in the pouch. Other Sodan carry Mitchell away but abandon their comrade as SG-22 attacks. The Stargate units take the fallen Sodan warrior back with them. At the S.G.C. Dr. Carolyn Lam works diligently with her staff to preserve the symbiote of the warrior. Mitchell’s recovery has been ordered as well. The Sodan leader, Haikon, has instructed Jolan to administer jomo se telek (a training ritual) to Mitchell to prepare him for his death against the fallen warrior’s next of kin in kel shak lo, a ritual fight to the death. Lam reports the warrior, Volnek, will survive, but the symbiote was unrecoverable. He is now surviving on tretonin. Back on P9G-844, Mitchell engages in jomo se telek with Jolan, but discovers he is a poor match for the Jaffa who engages him in many tests to prepare him for the coming battle against Volnek’s next of kin. Mitchell is eventually granted an audience with Lord Haikon, who explains how the Sodan managed to rid themselves of Goa’uld enslavement and establish their own society 5,000 years ago. Haikon is not swayed by Mitchell’s prodding that the Sodan never helped their brethren defeat the Goa’uld, and hopes that the Colonel plans to die well. Volnek has regained consciousness and, at first, refuses to believe that he is being sustained by the tretonin drug. Teal’c and Daniel try to get their true intentions across but Volnek has closed his mind to their words. After a training session, Mitchell finds a Prior being escorted through the Sodan village. He soon learns from Jolan that the Ori have been sending an envoy to their village for some time. At the request of another meeting with Haikon, the lord tells Mitchell that he and his people intend to worship the Ori, knowing good and well that they are not the Ancients they have worshiped. The Ori, however, show themselves to truly exist. For Haikon, this is the next best thing. 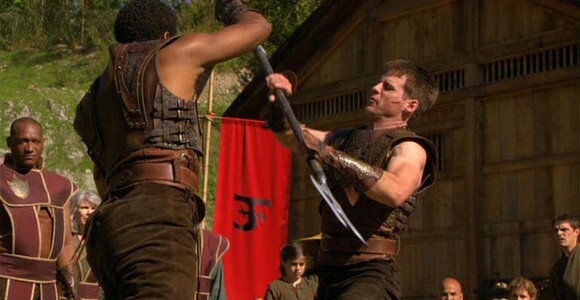 Mitchell, beginning to gain strength in the one-on-one combat with Jolan, confronts his sparring partner about the Ori and their religion. It is clear that Jolan does not fully support Lord Haikon’s decision in accepting Origin, but he is not ready to face the full effect of their presence. In two weeks Volnek has given no information of worth to Teal’c, though they are now aware of an Ori Prior presence among the Sodan. Scans of the planet with Prometheus and U.A.V.‘s have turned up negative and the international committee is counting the pennies used in the search and rescue of Cameron. Landry insists that better methods to locate him be found soon before he is forced to declare Mitchell M.I.A. Lord Haikon hammers his gong and asks that Volnek’s closest kin step forward to engage in battle against Mitchell. To Cameron’s surprise it is Jolan. Volnek meets Tass’an, the leader of a group of free Jaffa who settled on Sartorus. Tass’an explains the impact of the presence of the Ori Prior, how hundreds of his people were killed when the Prior decided to level their cities. Only now does Volnek’s interest hold. Mitchell fights against Jolan in kel shak lo. Not a minute into the death match Jolan gains the upper hand and suffocates Mitchell to death. His heart stopped, Lord Haikon declares the Colonel dead. Jolan asks that he be permitted to give Mitchell a proper passing ritual. Seven hours later Cameron awakes. The elixir Jolan prepared may have been a bit stronger than he had intended. Mitchell is to return to Earth, while Jolan and a few warriors loyal to the ways of the Sodan prepare to face the Prior again. Returned to Earth, Mitchell confronts Volnek about what has happened on his world, and the fact that Jolan spared the Colonel’s life. With these words, Volnek is free to return to Sodan. But before he departs, he assures Mitchell that they will meet again. VOTE! 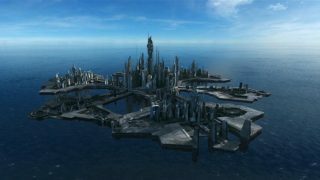 How would you rate SG-1's "Babylon?"